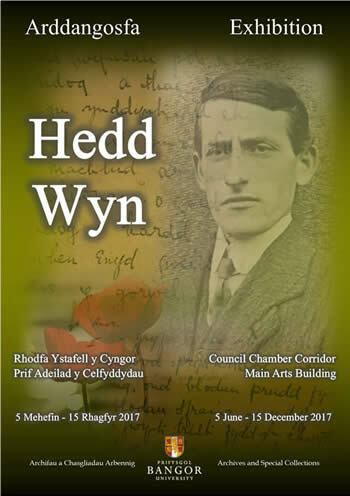 The Archives and Special Collections held an event to launch the Hedd Wyn Exhibition at the National Eisteddfod this year. The event took place on the Bangor University stall on the Eisteddfod field on the 11th of August between 10.30am and 11.30am and we were joined by the actors, Huw Garmon and Judith Humphreys, Professor Gerwyn Williams and the nephew of Hedd Wyn, Gerald Williams. 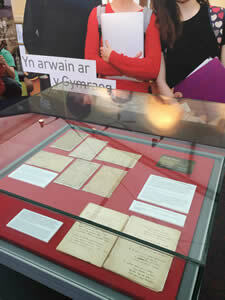 Visitors to the stall were given the opportunity, throughout the day, to see two original manuscripts from the Hedd Wyn collection, held by the University. The Archives Department opened its doors on Saturday the 24th of September and provided visitors with a feast of manuscripts. There was the opportunity to discuss the variety of archival collections that are held by the University and to view the 2016 exhibition, “Visitors and travellers to North Wales”. The English session was held between 10.00-11.00 whilst the Welsh session was held between 11.30-12.30. 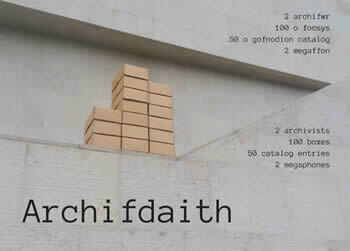 Archifdaith was performed in Pontio on the 31st of March and the 1st of April 2016. Over two hours, the artists, Cai Tomos and Marc Rees constructed / deconstructed imaginary architectural / archaeological forms to declare historical facts through a sequence of choreographic endeavours. It was a mobile performance and installation that united the past with the present in a journey through the public spaces of Pontio and painted the space with history. 3 students presented three stories to visitors to the Archives on the 18th of November 2015 as part of our "Explore your Archive" activities. This year, the guest speaker will be Professor Bill Jones of Cardiff University. He will be speaking, in Welsh on the subject of the Welsh settlement in Patagonia and the Welsh press in the 19th century. "'Garibaldi', 'Dyn y Bala' ac 'Apostol Mawr Patagonia' : Y Wladfa a'r Wasg Gymreig yn ail hanner y bedwaredd ganrif ar bymtheg". 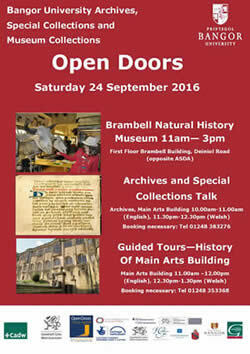 The lecture will be held in the Main Arts Building on the 4th of November 2015 at 6.00 p.m.
On Saturday morning, 26 September, the Archives and Special Collections took part in the 2015 Open Doors event. 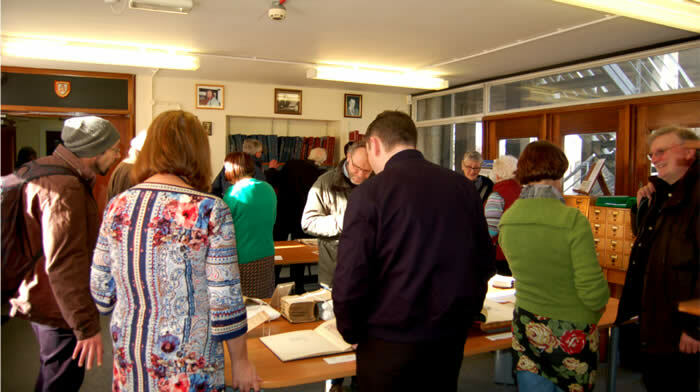 Visitors were given the opportunity to listen to the Archivist talk about the work of the Archives and Special Collections and to see a selection of special manuscripts held by the department. 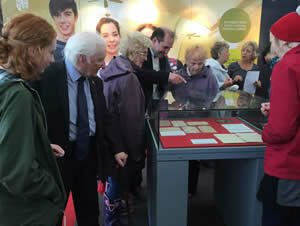 Following a question and answer session the group were taken to see the “Welsh in Patagonia” exhibition. To promote our "Welsh in Patagonia" exhibition in 2015, the Archives and Special Collections organised a traditional Patagonian tea party. During the event, the Prime Minister, Mr Carwyn Jones, shared with us his recent experiences on his visit to Patagonia to celebrate 150 years since the arrival of the first Welsh settlers in Puerto Madryn. We would like to extend a big thanks to all who showed their support on the day, including Professor Gerry Hunter, Mari Emlyn, and the Widening Access Centre, who partly funded the event. The Library and Archives Service is celebrating 150 years of Y Wladfa, the Welsh Colony in Patagonia, with an exhibition displaying a selection of material from the Archives and Rare Books Collections. Bangor has the largest collection of material relating to the Welsh colony in Patagonia outside the National Library of Wales. An amalgamation of several acquisitions amassing over 1500 items, the collection comprises manuscripts, letters, photographs, diaries, newspapers, books and plans presenting first hand accounts and photographic evidence of the lives of the pioneers and settlers who strived for linguistic and religious freedom with political autonomy 8000 miles away from their homeland. Tired of the oppression the Welsh language and culture faced in his home country, Michael D Jones sought to create a ‘New Wales’ across the seas. The Chubut Valley, a sparsely populated region in Patagonia, was chosen for the colony. In 1865 the Mimosa set sail from Liverpool carrying around 153 Welsh men, women and children for Argentina. The reality of life in Patagonia, a barren and inhospitable place, was to prove extremely challenging for the early settlers. The colony endured great poverty and hardships, such as drought and floods, as they struggled to make a living from the land. However, in time the community thrived and remarkably, today, descendants of the original settlers can still be found, speaking Welsh in Patagonia. The exhibition will be on display from 18th May until 18th December 2015 in the Council Chamber Corridor of the Main Arts Building, Bangor University.